Chronic disease presents significant challenges in managed care integrated delivery environments that are only highlighted when performance-based compensation is in play. This Case Study involves the evaluation of existing treatment interventions for COPD patients coupled with a new intervention. The purpose is to present an objective analysis of the difference in both cost and patient outcomes for different interventional options. Traditionally, most organizations would attempt to develop an ROI analysis to quantify the impact of a new or proposed program. 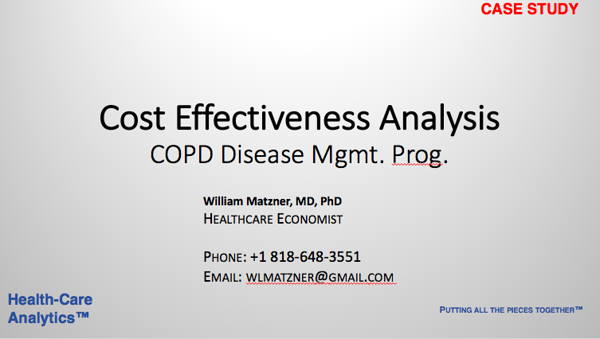 With Cost Effectiveness Analysis, both existing and planned or new programs may be evaluated and compared side by side with as many variables as necessary to effect actionable and effective data. Click HERE to see the 12-slide power point presentation.